It’s opportune that I’ve chosen to post every Sunday. Several “holidays” fall on Sunday, so my topic for those days is handed to me. It’s a no-brainer on Mother’s Day. Even though it’s just a made-up holiday, I gladly join the party. Mothers deserve to be given a day of recognition. Popular belief is that the kitchen is the heart of the home. No, no, the mother is the heart of a home. The kitchen was just admired by association. So, Mother’s Day, yeah, bring it on. As you might have already read in an earlier blog, I lost my Mom a year ago last Feb. 1st. In reality, I lost her a few years earlier, to Alzheimer’s Disease. She still knew me to the day she died, but the essence of my Mom had been clouded for some time. 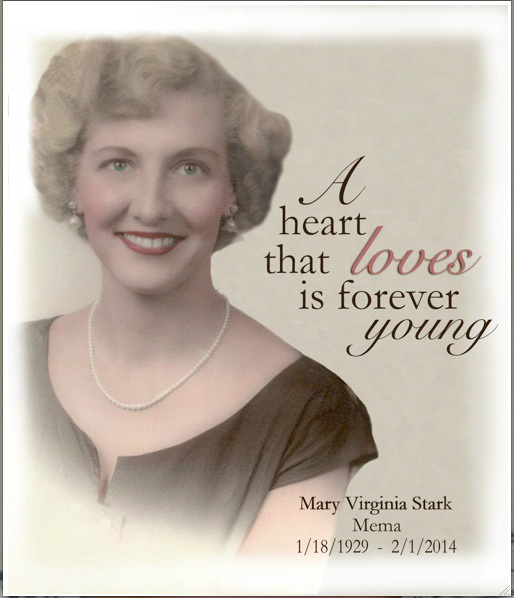 For a dinner to celebrate her life, (the night before she was buried with my Dad at Arlington National Cemetery,) I put together the table card pictured above for everyone in the family. That was the essence of my Mom. A young wife and mother who wanted nothing more than to raise a loving and happy family. That was all she ever wanted from life. I love both of my parents and they will always have my heart. They generously helped BK and I and they became our close friends in adulthood. But they were broken. We all were. Growing up, my father’s alcoholism kidnapped our family and the ransom was our innocence. It’s hard to grow up with a healthy perspective of family when you’re regularly saturated with the pain, embarrassment and insecurity of drunkenness. The legacy was passed down from my father’s father, (who was a gutter drunk,) and who knows how many generations before that. We were bound by the chains of a functioning, dysfunctional family, and there was no breaking out. My Mom tried her best to fight the menacing inebriation, but it was too compelling and it over-powered our family life. She held it off as long as she could and then there was no fight left. I guess when you’re incarcerated by alcoholism, you eventually succumb to the craziness. But even with the deficits that came with our situation, my Mom, at times, should have been classified a saint. A married life wrought with dysfunction, she was still able to teach us what profound love for your children is all about. People tell me I’m a good mom, I hope that’s true; I’ve definitely made mistakes along the way. But, if goodness was measured by love, I’d be the best mom in the world. I don’t think I could possibly love my children more intensely. They are a shared passion for BK and I, and they’re the coolest gifts I’ve ever been given. I couldn’t have asked for a more fulfilling charge. But, in honesty, for me, motherhood was an inauspicious start. Maybe because my family life growing up wasn’t exactly Ozzie & Harriet, I didn’t really care about having kids. I was focused on starting my career and it never dawned on me to start a family. Until, (after seven years of marriage,) we found out I was pregnant. From that moment on, I was hooked. Luckily, I had some significant Mom help along the way. And on this day of honoring mothers, I need to celebrate two of those, in particular. First, I’ll circle back to my Mom. To her credit, (or discredit, whatever the case may be,) she supported every crazy idea I ever came up with. On top of that, she was my champion, always telling me she was proud of me. She gave me some mad mom skills, like teaching me to sew then telling me she would buy me fabric instead of clothes. (That served me well, especially as a mom.) There is a long list of things I could recount, she gave me so much, but the most important thing she handed down was the love and happiness she dreamed of for us kids, (we were four, two boys and two girls;) that was the legacy she passed on to me. Gratefully, she was able to see her bequest take root before her mind was stolen, and she found great joy in the extraordinary love we share with our children. We had our rough times early on though; being the product of a dysfunctional family can mess with your familial rhythm a bit. Especially when it comes from both parents and BK and I shared that distinction. Luckily, our get out of jail card was sobriety. That brings up Mom number two, Auntie K, or “AK”, as she’s lovingly known in BK's blog, Nation of One. Hers was a legacy that changed our lives. She passed on the commitment of breaking the chain of dysfunction; by example, she showed us how to overcome the sadness that had been handed down through our families, like a dominant genetic trait, and it was our saving grace. Sparing you family details that are for another day, suffice it to say, AK is our Mom and we are some pretty lucky kids. Her love, generosity, and humor are the legacy I want for my kids. They are heirlooms that are priceless. There is one last group I want to mention on my way out the door. They are people who restore my faith in humanity. The new Moms of today, at least the ones we are connected to, are proving to be a generation of stellar parents. Of the group I’m referring to, several have already had their babies, and three are still pregnant, (one with a second.) Each of them, upon finding out they were pregnant, stopped drinking and in two cases, smoking. Cold turkey. These are some hard partying ladies. (And weren’t we all at their age.) But the love of a child they haven’t even met yet means more to them than any established lifestyle. They exhibit selflessness and a fiercely protective nature at the mere thought of their child coming into the world. They are earning their recognition already. Theirs is a gift of not only health and well being, but one of profound and altruistic love, I hope they continue to pass it on for generations to come. To Mom and AK and all of the woman who are devoted Mothers, nicely done, ladies, nicely done.